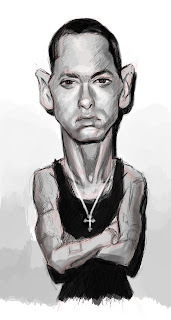 i haven't posted anything in a few days so i decided to share the Eminem caricature ive been working on. this is the third version of this piece ive worked on over the past week or so. i never thought this guy would have such a hard face to draw. anyway i hope to post a finished version soon. I also started my new character design class today and what ive seen so far is pretty cool. hopefully i will post some work from the class on here too.